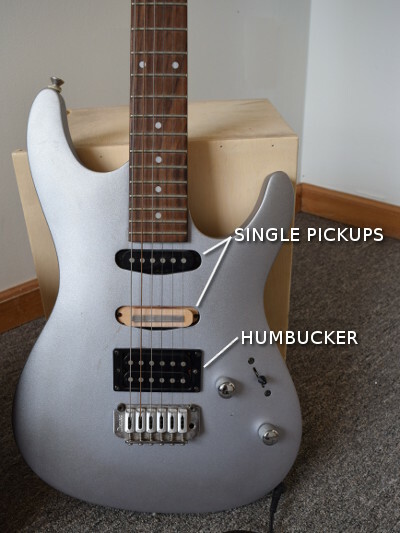 K&J builds an electric guitar pickup with neodymium magnets! 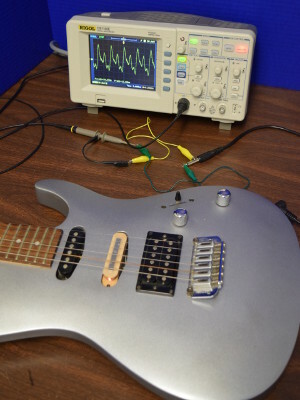 How can you build a pickup for an electric guitar using neodymium magnets? Both musicians building their own pickups and engineers designing new products want to know. Building one ourselves seemed like a great way to learn about what’s involved, and discover some of the interesting questions and concepts about how these things work. Besides, we’ve always wanted to make one! An electric guitar pickup senses the vibrating strings above it. It converts this signal into a weak electrical current to send to an amplifier and speaker. 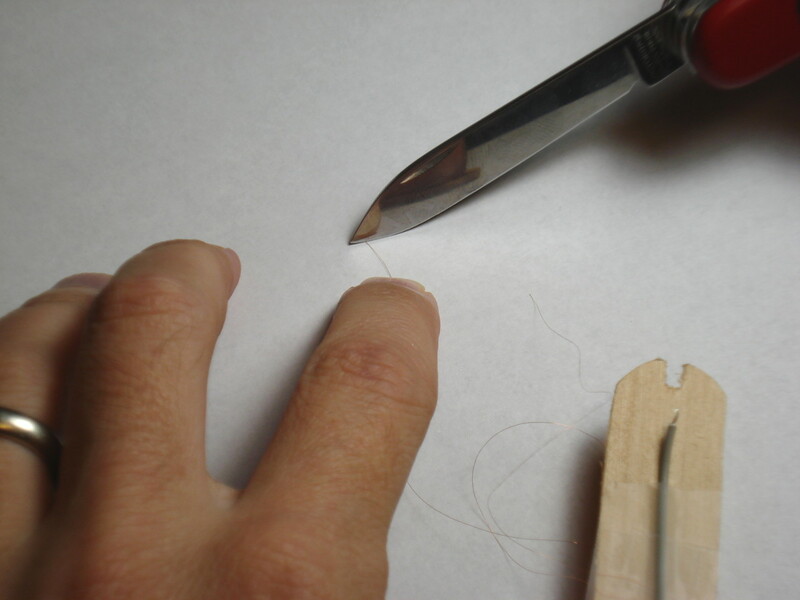 On non-electric instruments like acoustic guitars or pianos, a vibrating string generates the sound. To make the sound louder and richer, the wood structure of the instrument amplifies this sound. An acoustic guitar is a hollow box that resonates to increase the sound. Electric guitars don't need this "hollow-box" amplification. 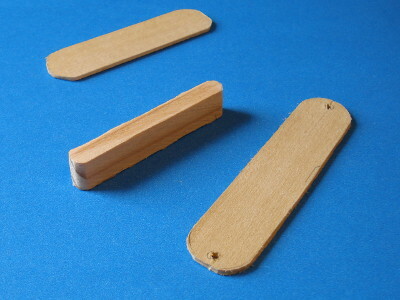 They can be a simple slab of wood with strings, since the amplification is done electronically. How does an electric guitar pickup work? 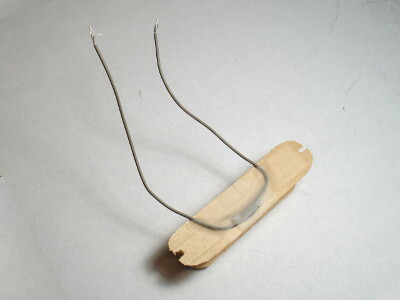 A vibrating guitar spring, a magnet and a coil of wire. From an electronics standpoint, an electric guitar is a fairly simple device. There’s a magnet (or magnets), a coil of wire and the vibrating strings themselves. 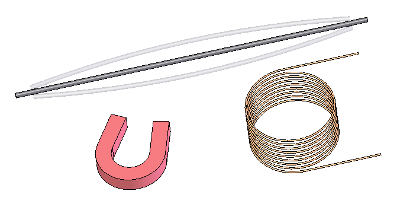 The coil of insulated wire is usually made with very, very thin wire, wound thousands of times around. 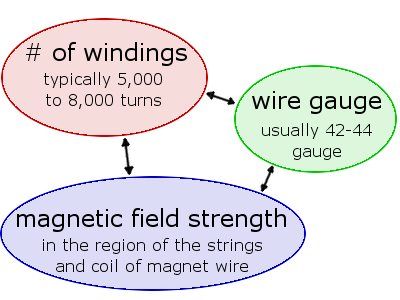 The voltage across the ends of the coil increases with the number of windings (described by Faraday’s law), so more loops of wire works better. It wouldn’t work as well with only 100 turns! The coil uses very thin wire to keep the coil close to the magnets. It can be thin since it isn’t carrying very much current. According to Faraday’s law, if the magnetic field inside that coil of wire changes, an electric current will be induced in the wire. With electric guitars, the vibrating steel string makes the field in the coil change ever so slightly. It’s enough to generate a weak current in the coil. We hooked up an oscilloscope to the direct output of our pickup to see what it looks like. With the scope, it's easy to see the sound waves after they are converted into electrical waves. The signal is incredibly weak. We're talking about voltages around 0.04 volts and very weak currents around 0.01 milliamps. How can this weak signal be made usable? By amplifying it a lot. A pickup wired to an oscilloscope. Each of the 6 strings shows a different note/period/frequency. We took an old guitar and removed one of the pickups from it. Our goal is to build a new pickup from scratch that will fit into the same spot on this guitar. Check out the design of the old pickup! 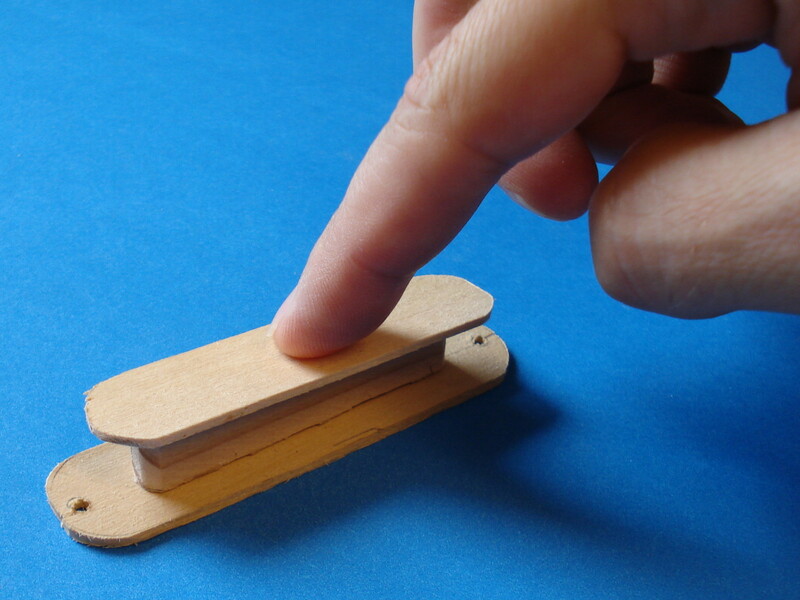 It uses inexpensive ceramic magnets that touch 6 steel cylinders. The magnets are hidden underneath the coil of the pickup. The steel cylinders are often called, “pole pieces.” They direct the magnetic field up to the strings. The steel cylinders form part of the magnetic circuit. They allow this pickup to use inexpensive ceramic magnets without demagnetizing them. Used alone without the tall cylinders, ceramic block magnets like those are likely to slowly demagnetize themselves over time. It’s a slick, simple solution to use a cheap magnet. The windings of wire are hidden by a layer of black tape wrapped around it. The new pickup! 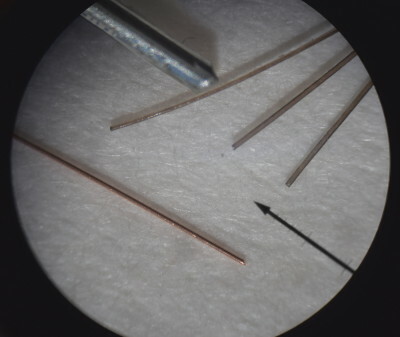 The many windings of copper-colored Magnet Wire are visible, as well as the thin BY041 block magnet on top. Since neodymium magnets don’t demagnetize as easily as ceramic or Alnico magnets, we changed our design a bit to make the construction a little easier and more flexible. We measured the field strength above the old pickup, and found that the field strength was around 60-100 gauss up where the strings are. Measuring all the pickups on the guitar at this string height, we didn’t see anything stronger than about 150 gauss above any of the pickups. We found that a thin, 2" long BY041 block magnet taped to the top of our pickup provided about the same magnetic field strength as the original. Neat! You might choose to embed a magnet down inside the pickup to produce a smaller package. Our motivation was flexibility, because we wanted to try a lot of magnet sizes. If you like the idea of 6 individual magnets, you could do a similar thing with six thin discs. They don't need to be tall cylinders like Alnico magnets or the steel pole pieces of our old pickup. We crafted a wood spindle in the shape of the old pickup. Wood might not be the most ideal material, but it was fast and easy to shape. Any non-ferromagnetic material would do; plastic is common. If you have a 3D printer, you can model and print some interesting shapes without having to glue individual pieces together. Trace the shape of the old pickup. Top, bottom and middle pieces. Stack them to form a wooden spool for the wire to wrap around. 42 AWG magnet wire, a few hairs and a common office staple. The same view zoomed in with a microscope. We used 42 gauge magnet wire, which you can find in small spools here. Thin wire like this is commonly used for pickups. Most pickups are made with 42, 43 or 44 gauge wire. We only offer 42 gauge, the thickest of these three. It is probably the easiest to work with. What is magnet wire? It's not a magnet. It's copper wire made with very, very thin insulation. It's perfect for applications like this. Learn more in our earlier article about how to make a simple electromagnet with it. Caution: This wire is really, really thin. It’s probably much thinner than any wire that you’ve worked with before. 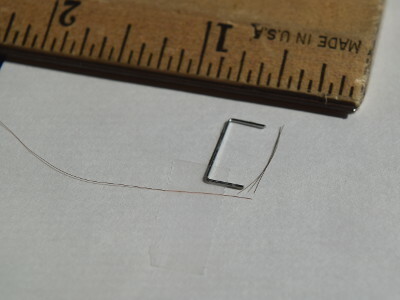 It is literally as thin as a single hair. It breaks very easily! We broke the wire a number of times while trying to get this pickup wound and had to start over. We measured the open resistance of the old pickup with a multimeter at about 3.9 kOhms. The goal for our pickup was higher, aiming for 8,000 turns. This wire is about 1,659 Ohms per 1,000 feet. Roughly speaking, that means we should see somewhere around 6 kOhms with 8,000 turns on this pickup. Winding wire around the pickup 8,000 times seemed awful tedious, so we brought in a little mechanical help. We re-purposed a sewing machine for the task. By temporarily attaching the pickup to the rotating wheel on the side of the sewing machine, we had a ready-made wire-winding machine. It even came with a foot pedal that controlled the speed! Our home-brew wire winding setup. 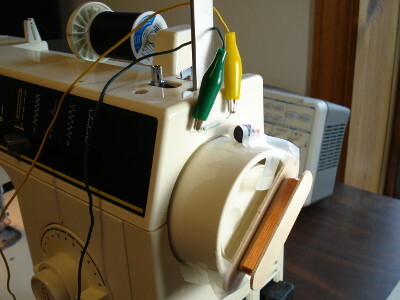 The pickup is taped to the round hand-wheel on the top right of the sewing machine. A spool of wire is on a spindle at the picture's top right corner. The wire runs over the red wheel at the bottom of the picture to help keep the tension constant. The red/black D68PC-RB spins with the hand wheel. 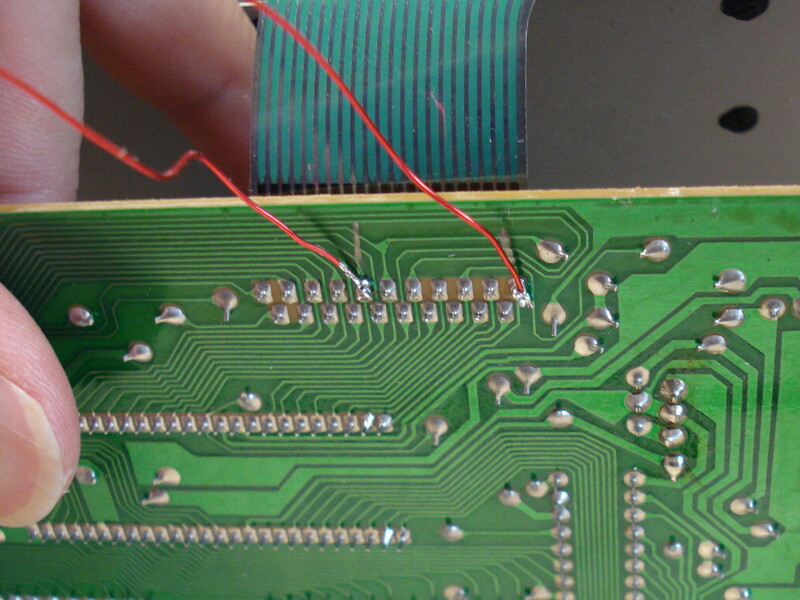 The reed switch is attached to the green and yellow leads. We wanted some automated way of counting the turns of wire. If we had to keep counting 8,000 turns in our head, we would probably lose count quickly. Naturally, we used magnets to solve the problem. 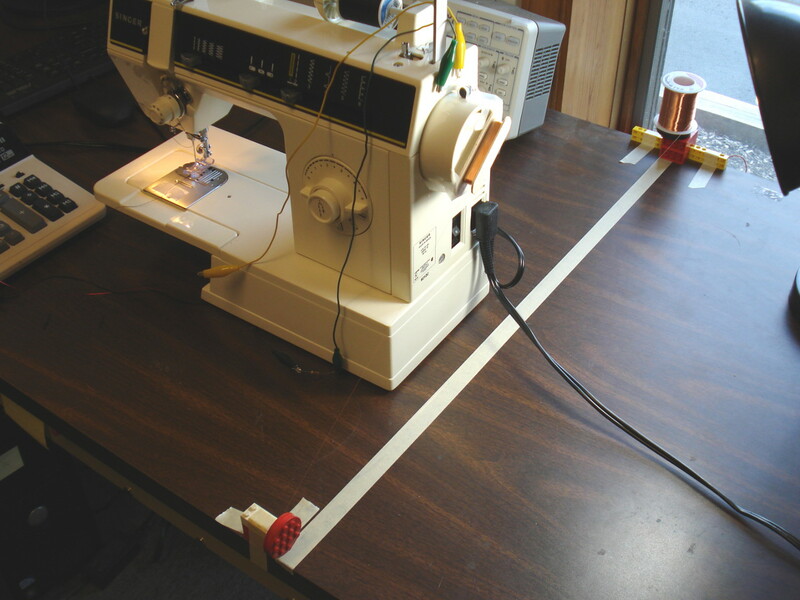 We attached a single D68PC-RB red and black cylinder magnet to the spinning wheel on the sewing machine. The magnet spins with the wheel. We placed a stationary reed switch to the body of the machine. A reed switch is a simple, inexpensive sensor that makes contact (closes the switch) when you get a magnet close enough. (Learn more about how reed switches work here.) With this setup, the switch closes once for every turn of the wheel. Now we needed a way to count how many times the switch closed as the magnet swung by. Rather than designing some fancy circuit, we again re-purposed an existing device. An old calculator is perfect for this! We wired up the reed switch to the circuit board inside the calculator. A little poking around revealed which contacts get closed when the PLUS key is pressed. After we soldered the two wires to these contacts, the calculator now interprets the closing reed switch as a hit of the PLUS key. When winding, one is added to the total every time the magnet rotates by, just as if you pressed the PLUS key each time. Simple and effective. The 2 wires from the reed switch are connected to the ends of the PLUS key inside the calculator. Note: This thin magnet wire is very fragile. It's easy to break. On about our fifth try, we made it to 7,200 turns of wire before breaking it. That was close enough! After our pickup was wound with enough turns, we soldered lengths of thicker, more durable hook-up wire to the ends of the magnet wire. These two ends were then connected to the old connection in the guitar (not shown). Gently scraping the thin insulation off the end of the magnet wire. UPDATE: With this wire, scraping off the insulation probably isn't necessary. The soldering process melts it away, and scraping only increases the chance of breaking the wire. Carefully soldering thicker wire to the end of the magnet wire. We built a quick and dirty prototype to show for this article, not a high quality, finished pickup. While instructive, this pickup probably isn’t something you want to install on your guitar for your next performance. When we tap it with a finger, it makes a loud thunk in the speaker, like tapping a microphone. Professional pickups don’t do this. Why does it thunk? We think it’s because of 2 different steps we skipped. 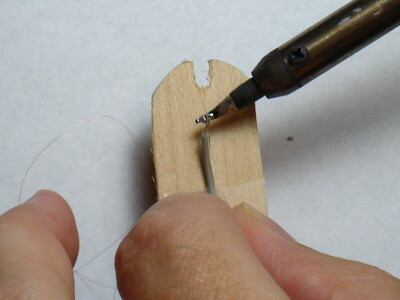 One: After winding the wire, pickups are normally dipped in hot wax. This acts like a big glob of glue to hold the thing together. It prevents vibration of individual wires within the coil. It also seals it from moisture sneaking in there. Two: We didn’t secure the magnet to the pickup very well. We held on the thin BY041 magnet with Scotch tape. This was great for us to try out all sorts of different magnets, but not very secure. When we tap on the magnet, it moves ever so slightly. Since the pickup is an incredibly sensitive device that detects the smallest changes in the magnetic field, it interprets the slight movement of the magnet as a loud thunk. 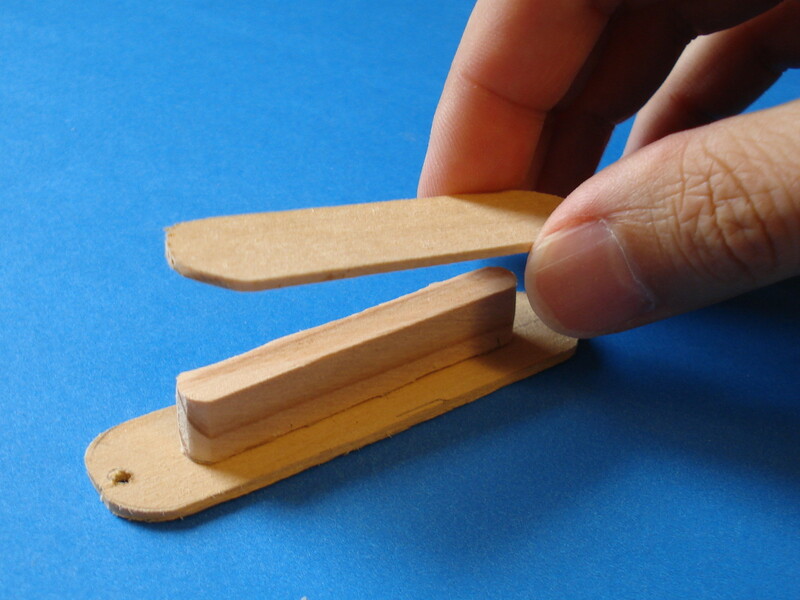 The thin wood construction of the magnet spindle probably isn't the optimal choice either. It's probably better to choose a material that doesn't flex as much. A common question from guitarists is, "How do humbucking pickups work?" The design of humbuckers is a clever innovation from decades past. The humbucking pickup passes the vibration of the guitar string while attenuating the hum and noise present all around the guitar, from power lines and other electronic devices. How is this possible? 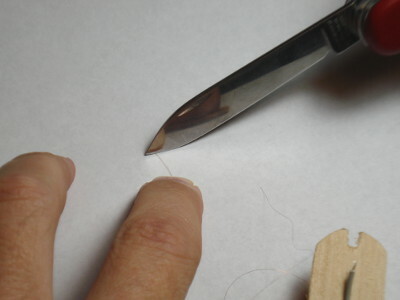 The humbucker uses two coils of wire to pick up the guitar strings' vibrations. However, the magnets are installed in the two coils in opposite polarity, such that they produce signals that are effectively out of phase in each coil. If the coils are connected correctly, signals from the strings add together from the two single coils. But electromagnetic fields hitting both single coils from external sources, like lighting fixtures, cancel out because of the way the coils are interconnected. Thus, the good guitar signal is double the strength that would be had with a single coil alone, and the interference is cancelled to a great extent in the process. 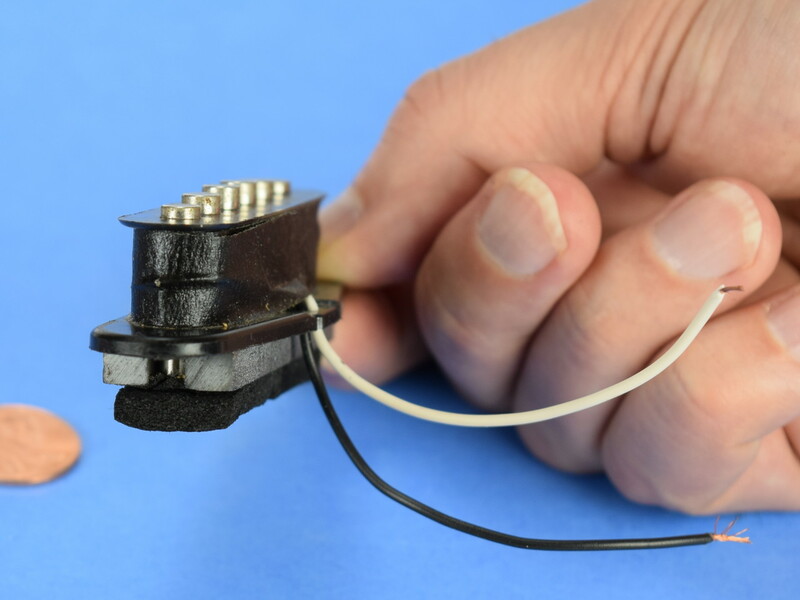 Basically, a humbucker is a set of 2 pickups like the one we made, except the magnets and the direction of the wire windings need to be setup in a particular way. This is a good reference at Stewart-MacDonald about which way the windings and the magnets should go inside a humbucker setup. The physics behind electric guitar pickups is hugely interesting and complex. We had a huge list of questions about how they work, most of which didn't get answered with this rough prototype. The following items are either practical things you’ll want to learn before making a guitar pickup company, or ideas for your PhD thesis! We’d love to build 20 more pickups to try figuring out some of the answers, but ran out of time. This is a huge, interesting topic that spans the science of electrical engineering and sound and the art of music. How does the number of wire turns affect the sound? It is an important number. You can search the Internet and find a lot of explanations, but it’s hard to find ones that bridge the worlds of electrical engineering (voltage levels, signal to noise ratios) and music (brighter tone vs. muddy sound). Does the geometry of the winding affect the sound? Probably so. If we have the same magnetic field strength at the strings, would we get a different sound by having a thin magnet up close or a bigger magnet far away? For example, we show the pickup we made with a thin BY041 magnet on top of the pickup, close to the strings. We found that the sound was very similar if we removed that magnet and installed a thicker BY044 magnet underneath the pickup, farther away from the wires. Which is better? If we used a bigger magnet with less windings to get a similar signal, does it sound the same? There are lots of relationships here that are all interrelated. Changing one is just one piece of the puzzle. Will strong magnets reduce resonance? Can they be too close? We’ve read a number of articles describing how having the magnets too close can dampen the string. This makes sense; magnets pull on the steel strings. We tried it out ourselves to see if we could see this reduction in vibration. To exaggerate, we used some of the largest magnets we have. These are much stronger than you would ever want to use in a guitar pickup! While hard to measure, we didn’t hear much difference in how long the string would ring. We didn't measure this very carefully, though. We did see the powerful magnet visibly deflect the lowest string, so it's definitely affecting it. One could design a pickup in a very different shape with neodymium magnets! 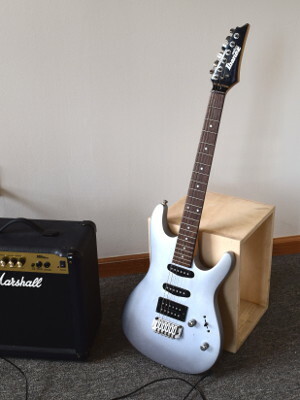 Since we were prototyping with an existing guitar, we copied the usual shape. It doesn’t have to be that way, though. 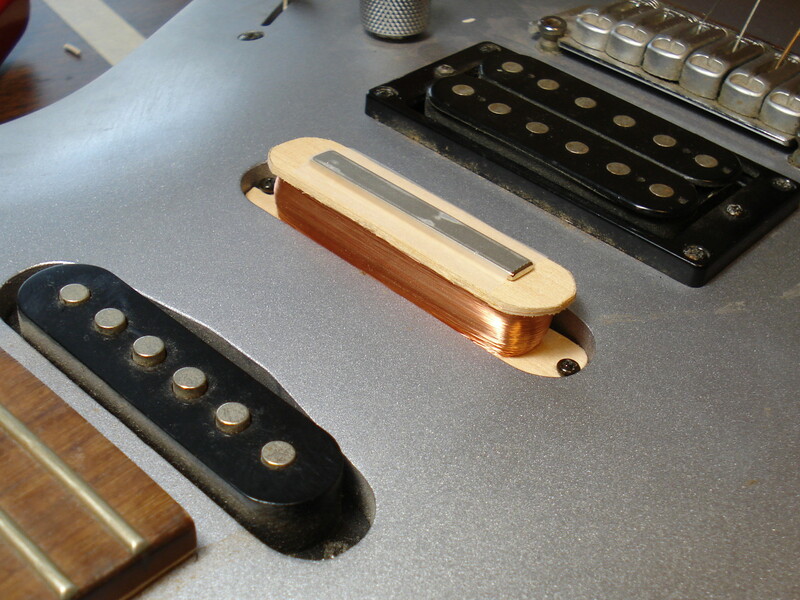 Pickups have been made with ceramic and Alnico magnets for decades, so it’s kind of an expected tradition that the pickups are so tall. That’s a design limitation of those magnets, not neodymium magnets. 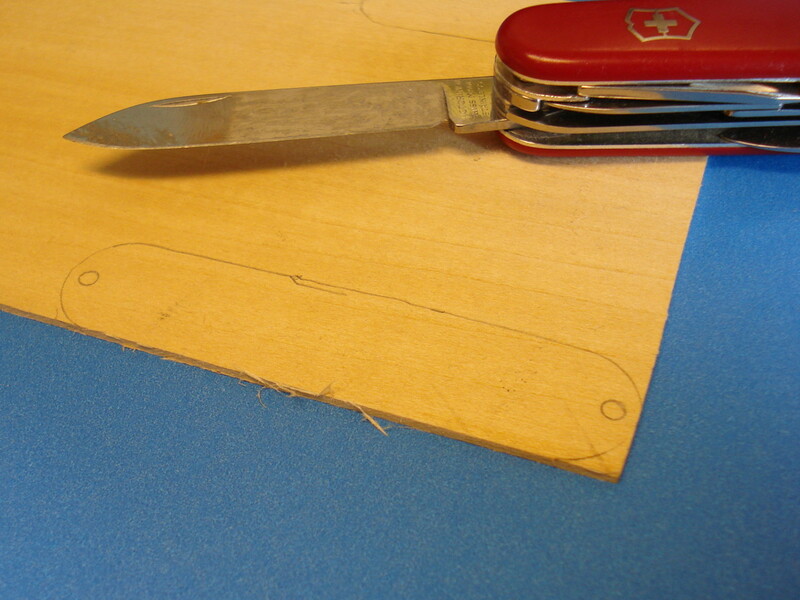 We’d like to see a guitar body without any pocket or hole cutout in it, with a pickup that’s super thin. 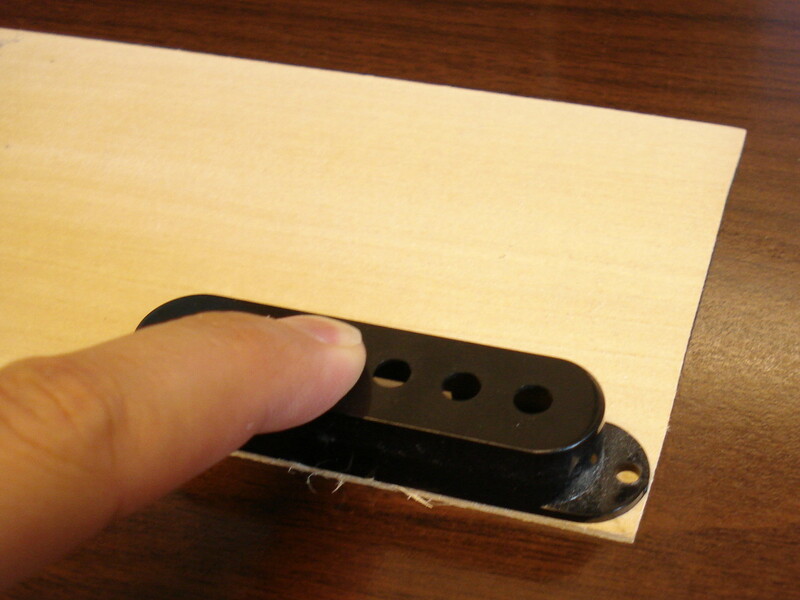 One could make a pickup a little larger in area, but very thin so that it just sets on top of the body of the guitar. Imagine a guitar body with no pockets, and pickups that are less than 1/8" thick; that would be neat.